Maintaining your commercial and industrial grade equipment takes expert knowledge and experience. If your equipment breaks down, we are available 24/7, 365 days a year. Refrigeration service and maintenance is an integral component in keeping your business running smoothly. We make sure that scheduled maintenance is taken care of on-time and efficiently. Our technicians ensure that our customer’s equipment is fully functional through scheduled maintenance and on-site repair calls. We provide our customers with the assurance that the job will be done correctly. 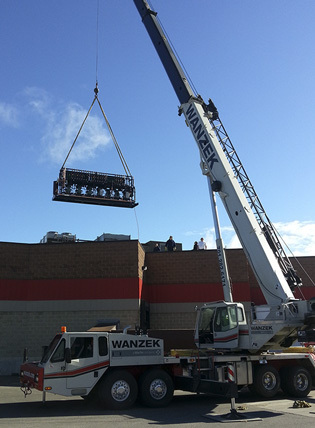 We install commercial and industrial refrigeration, heating, and general HVAC equipment for super markets, convenience stores, restaurants and bars, schools and large arenas. No matter the scope or scale of the project, we have the experience. After opening the doors into the industry of refrigeration back in 1994, Red River Refrigeration has seen many changes that have been made in energy management computer-controlled systems. We can service, sell, and install systems for your refrigeration and HVAC needs. Industry leaders such as Emerson Retail Solutions (CPC), Micro Thermo, Novar, and Danfoss are systems that we are trained in and work with every day in the service field. From optimizing power on your refrigeration equipment and HVAC needs to leak detection for your refrigerant systems, we will not only save you money, but with store alarm and remote monitoring of the systems, we can monitor the systems for issues before they can become a problem. Along with energy management, we can help with solutions for your LED lighting needs for walk-in’s, glass doors, and shelf lighting. An ECM motor upgrade can also save you more on your energy bill. If you are upgrading, thinking of a new installation, or need service contact us to discuss the best solution for the job. We promise prompt, professional service 24 hours a day.